@Dar-ren19 wrote: He's gonna chew his teeth off if he's not careful lol. Those things aren't good for your teeth, even the sugarless kind. Really? I chew gum all the time, even right now. @Starliteprism lol maybe. But my dentist really warned my family against it last year. He said the "pull" on the teeth while you chew the gum is the real damaging thing. Am I reading too much into it or could T.R.A.V. stand for something? Has this been discussed? Of course my mind tried to find something behind this "T.R.A.V.". It was fruitless. I was at The R... After Vader - but it felt so cheesy I gave up. 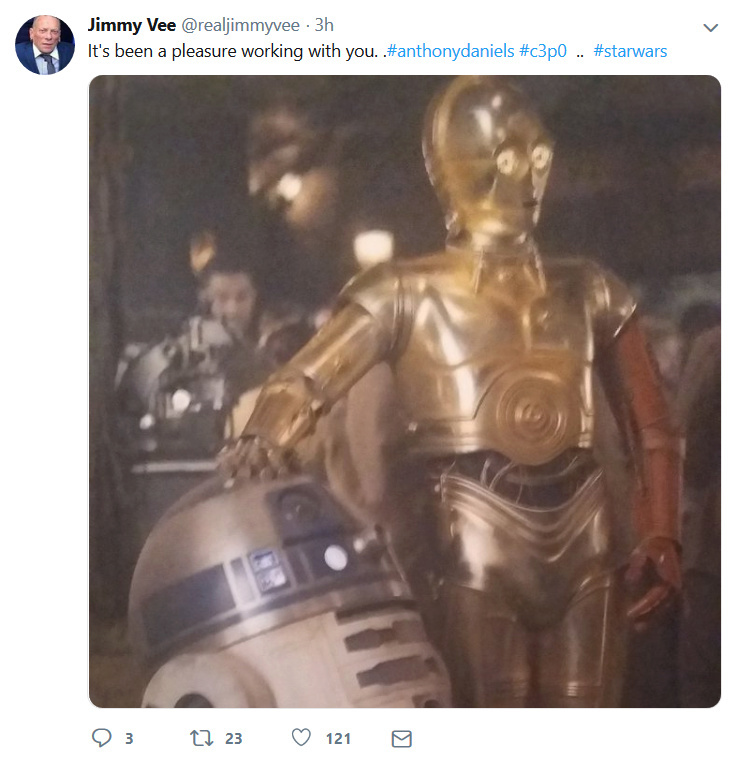 So, Jimmy Vee, who does R2-D2, is done evidently. All the droids are out, it would seem. Clearly, the title is Return of the Reylo. JJ gonna have it redacted from the trailers too just to be safe. I actually hope for an announcement during Valentine's Day... Or at least a pro-Reylo tweet from some of the SW twiter accounts, like we had a few weeks ago! I thought of The Rebel Alliance Victory, but wrong trilogy. That would be pretty lame for a title anyway. But maybe just as a thing that happens rather than a title? @Mila Lazarus wrote: I actually hope for an announcement during Valentine's Day... Or at least a pro-Reylo tweet from some of the SW twiter accounts, like we had a few weeks ago! Yessss. Share the love with us on Valentine's, JJ! But really, this is pretty close to the release date for us to not even know the movie's freaking name. I'll never understand the marketing choices for this trilogy. Title's coming in the next 10 days. Which is an easy guess because we know principle photography is scheduled to wrap by month's end, plus two cast members need to be in Los Angeles by late next week for all of the events around the Oscars and the ceremony itself. The Disney Corporation never does anything which doesn't maximize their brand exposure and market share - it's not a random that they're going to broadcast a movie during Sunday primetime viewing hours which they'd already licensed to another channel for exclusive broadcast rights. Keep in mind they've managed to get cross-promotional "news" items about Star Wars Celebration and ILM/Skywalker Ranch's technologies on 20/20 or how all of the film promotional interviews were on their morning chat shows. And right now one of their cast members is the red carpet interview MVP for this year's awards season, Richard E. Grant. Not to mention that they're also broadcasting the Oscars, including the red carpet arrivals/interviews. Production has to wrap by the end of this month, which is next week, and they have their biggest Q1 event happening in that same time frame. It's always possible they're planning on a special primetime broadcast of TFA to promote their theme park launch or TV show the general audience really doesn't care about. But they'd get bigger ratings for that broadcast and more exposure in the news cycle if this is happening in conjunction with the announcement production has wrapped and what the title is (and they'd get even more of a boost from peoples' inevitable questions to Richard E. Grant as a nominee). I know people have been impatient for any kind of news. But the expectations that it was going to come out the same week in January as TLJ's title (which at that point was already 6 months into post-production) or the Super Bowl were unrealistic. TFA's title wasn't announced until production wrapped and Disney doesn't do anything at random, it's always timed for maximum brand exposure. Which considering how badly they're screwing up the format of the Oscars with today's newest dumba** announcement that they won't be broadcasting the Editing or Cinematography awards, they need every positive boost they can get around it. 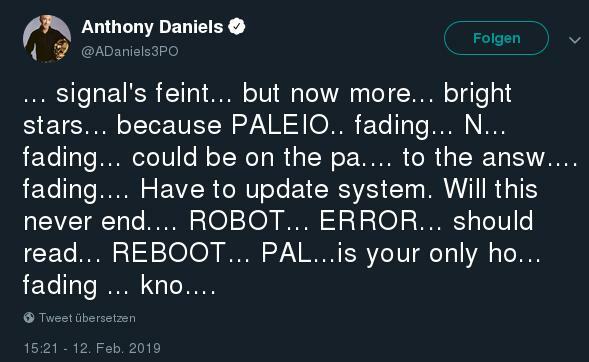 Of course, given how some people will use any new piece of information as a pretext to freak out, likely the title itself will kick off yet another gate. 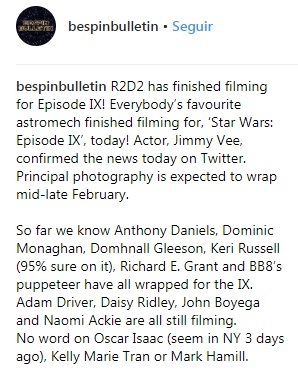 Looks like Adam Driver, Daisy Ridley and John Boyega are all still filming. I'm a little worried for Rose. I loved her character and want to see some kind of side-plot for her in IX. I'm not that interested in Poe's, Finn's and Dom's storylines. And i'm happy that Naomi has a lot of screentime it seems. @ZioRen I agree with the above, TFA and TLJ had both finished filming before their title reveals. Avengers: Endgame didn't have a title reveal until December, just 4-4.5 months out from the actual film (even though I think the title is a bit dorky). Or even, heaven forbid, JW: Fallen Kingdom was only given a title about 7 months out. 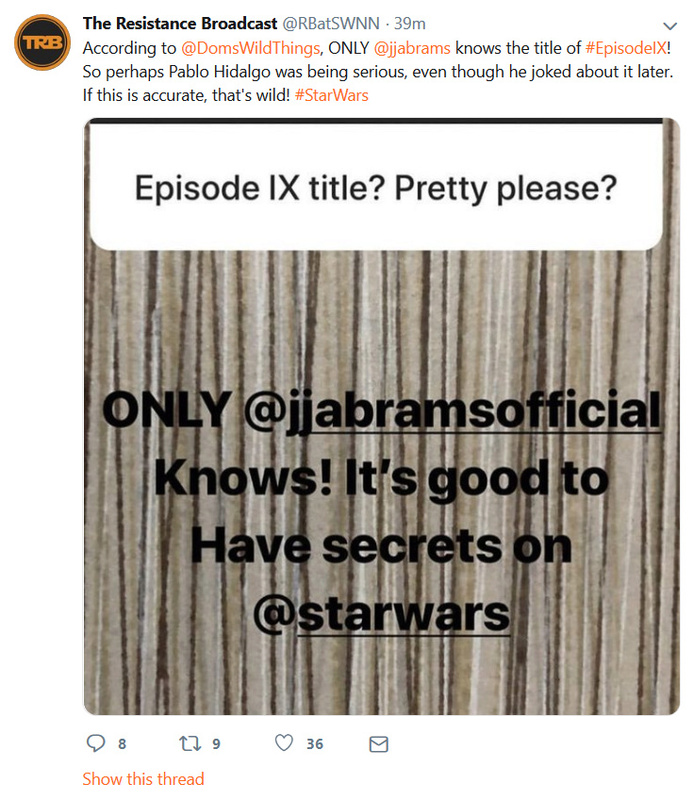 The lack of a title or any official news has actually done a weirdly good job, intentionally or not, of creating hype for IX. I thought the bigger gap between Solo and IX would hurt Solo but benefit IX, and it turns out to be true. I think fans and GA will be ready for SW in 10 months. The challenge will be to convey the crux of the story, and why people should get excited. As opposed to the rampant speculation before TLJ, where people didn't even need to be given a reason to be excited. Interesting that John is still filming, but Oscar's been gone for a while now. Then again, Finn was always one of the main 3, while Poe, for all he's been elevated, maybe still isn't fully among the core trio. It’s really interesting that Naomi is one of the last to finish with the big 3. It looks like she is not in a small resistance role / Lando’s daughter or whatever. Think if they were all descendants of the saga. @giaciak2 wrote: Think if they were all descendants of the saga. @californiagirl wrote: Well that's cryptic. LOL C3PO should maybe quit smoking fags... It does no good to his circuits! Lol I always thought C3PO was kind of irritating! !